The culture of the Maldives is influenced by different visitors who arrived in Maldives throughout the times. We can see Indian, Sri Lankan, Arabian, Persian, Indonesian, Malaysian, and African cultural traits. The Maldives is located at an important crossroad in the Indian Ocean and the visitors have left their marks. However, acting as a melting point the Maldives assimilated these influences and has created a unique cultural identity. The country’s primary language is Dhivehi. 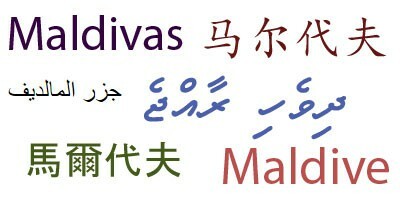 Interestingly enough, Dhivehi is a unique mixture of Arabic, English, Hindi, Sinhalese and Urdu. Hence it is similar to many of the languages spoken in North India, South East Asia, and Sri Lanka. Though there are a few dialects of Dhivehi spoken in the Maldives, formal Dhivehi is used in education and all government transactions. Of course, since tourism is a major industry in the country, almost all popular international languages are such as English, German, Italian, Spanish and Japanese are widely spoken, especially at the hotels and resorts. Most travelers will easily find someone who can communicate with them fluently.